In this article we describe how to write a minimalistic Windows debugging loop in python. Modern applications usually spawn more than one process and the bugs in them generate different type of crashes. Our minimalistic debugger shall detect "any" crash condition of a process or process tree. Be aware that our aim is purely educational and more mature and complete options exist. If you need a full fledged debugger in python you should check winappdbg. After dealing with full/complete/true debuggers for a while, we decided to develop our own tiny debugger in python from scratch. Understanding the debugger innerparts is a must when dealing with complex bugs in complex application settings. Our tiny debugger is only a few lines long and has the functionality of either detect a crash or close the process with a timeout. Our code will run on windows and depends only on ctypes. ctypes is a mature and powerful library to access native code from Python. With ctypes we can interface with the system DLLS using C like structures for parameter passing directly from the interpreter. For example, we can call to kernel32.CreateProcess function from our Python code. Other parameters, like lpProcessAttributes, are optional and can be NULL in most cases, hence, there is no need to define their types in python. Summing up, for our purpose CreateProcess use only two arguments with complex types (in red): LPPROCESS_INFORMATION and LPSTARTUPINFO. So, we need to define these 2 non-trivial data structures in ctypes. where HANDLE and DWORD are alias to c_void_p and c_ulong, existing types respectively. Note: LPSTARTUP_INFO is defined in similarly form. Note: defines module is a python program with the definition of structures like STARTUP_INFO, PROCESS_INFO and the other types used in this article. We craft the CreateProcess arguments so the debugee process pass the debugger every exception. In a debugging session any exception in the debugged process is reported to the debugger as an event. Events include process and thread creation, the loading of a dynamic-linked library, and in general any exception occurring in the debugged process. Also a process can create multiple child processes, and of course, we are interested in the child's crashes as well. So using the dwCreationFlags argument we indicate that once the debugee creates a new child process, the debugger gets also the events produced by the newly created processes. Most of the magic resides in the dwCreationFlags argument. This flag is used to indicate that the calling thread is debugging the new process and its child processes. The next step is to control the behavior of the recently created process, the debugee. For this the debugger must execute a debugger loop as explained the next section. The main debugging loop is quite simple and is described in some detail in the windows writting debugging loop reference. It consist in an "infinite loop" that waits for an event on the attached processes to occur. When an event happens, the debugger decides how to proceed based on the information provided in the DEBUG_EVENT structure. Each event is obtained using the WaitForDebugEvent function, provided by the kernel32 dll. For each event received the debugger must decide what to do with it. For convenience, custom handler functions are defined for each type of event(ex. OnCreateThreadEvent in "writing debugging loop") and a switch statement dispatches each event to its correspondent handler. This structure will be associated to our target process (and its child processes ) and will give us information about the event fired by the debugged process. When a debugged process starts, it generally produces and dispatches events, and each one must be "handled" by the debugger and then eventually passed to the originating thread so it can continue. To do that, we need to build a debug loop to manage all events produced. Note: We need to build this structure using ctypes(the proceeding is similarly to the class ProcessInfo). Ctypes also provides union support. We aim for a simple crash catcher, thus we just need to know only if the event was due to a crash. At each event the originating thread is stopped to let the debugger handle the event. After the event is handled we need to explicitly issue a continueDebugEvent to let the debugee thread continue (as shown here). #that the function does not return until a debugging event occurs. #Process the debugging event code. #is used by the ContinueDebugEvent function. #Close all processes in the debugge loop. The main loop waits until there is no more PIDs in the pids array. Whenever a child process is created from the main process, it is stored in the pids array and removed from there when the child exits or finishes. If the running process exceeded the timeout, we close all the child running processes in reverse order (lines 46 - 49). Terminating a process at this point(line 48) will force its removal from the pids array in the next iteration (line 39). The rest will be ignored. EXCEPTION_DEBUG_EVENT is used to detect a crash condition. CREATE_PROCESS_DEBUG_EVENT and EXIT_PROCESS_DEBUG_EVENT are used to manage the pids array, to add (line 37) or remove (lines 39) PIDs from the pids array. So, when an event fall in InterestingExceptions we argue a crash occurred and can proceed to recollect all the information about why it was produced. Else we can continue waiting for another event. Note: The exception codes are simply numbers, and we have the definitions for each code in defines module, previously mentioned. 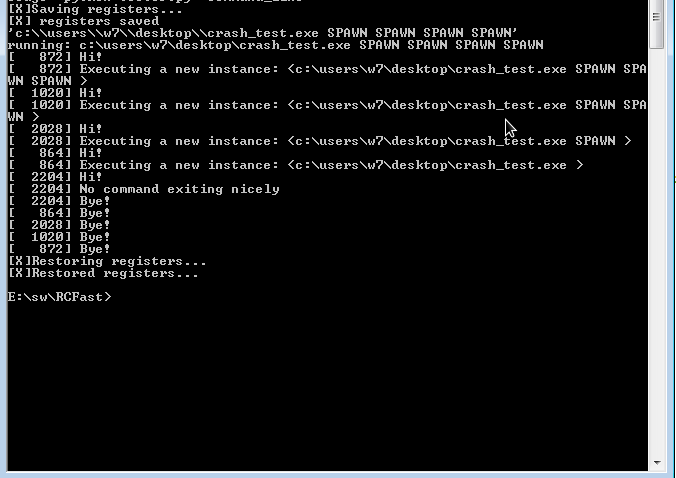 We test our implementation using crash_test.cpp. The program crashes in several different ways, possibly spawning child processes. Different crashes can be triggered using command line arguments. This run will create 2 child processes and then crash. With this we can test how our micro debugger performs on different settings. Note: The crash_test.exe can't reproduce a DATATYPE_MISALIGNMENT or IN_PAGE_ERROR exception. Any comments about how to produce such exceptions are welcome. We have tested our approach thoroughly. To show the behavior of our micro crash catcher, here we paste some pictures of it in action. In this case we can see that launching "crash_test.exe SPAWN SPAWN SPAWN SPAWN"
with our debugger, 5 processes are created (including crash_test.exe parent process), the pids are in brackets, and if we see the variable "closed" at exit of crash_test.exe process, it must be equal to "Normal". 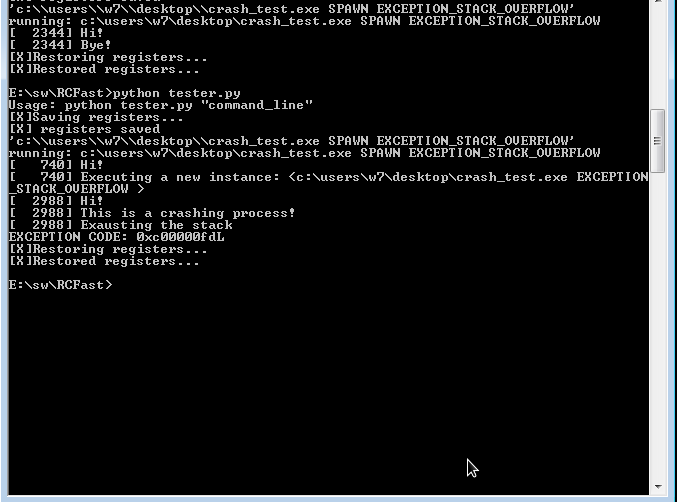 In contrast, here we debug "crash_test.exe SPAWN EXCEPTION_STACK_OVERFLOW", obtaining the exception code: 0xc00000fd, which represents the STACK_OVERFLOW exception. In this case we want to show that a process that never ends eventually timeouts. 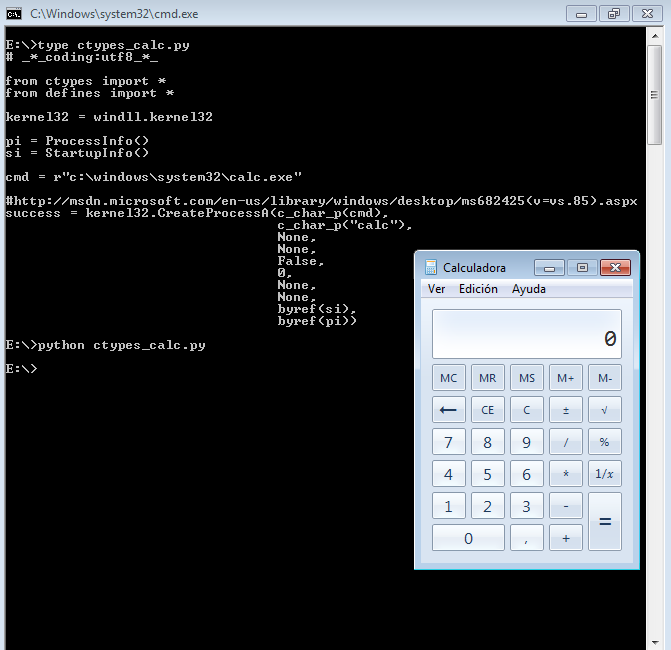 Here we use the the never ending interactive calc.exe. The timeout is set to 5 seconds. As you can see, the calculator starts, and waits for the user to input some numbers, and after 5 second it is forced to close. Other combinations of crashes, normal termination and never ending processes were also tested. Comments, doubts or suggestions are welcome. Maybe DATATYPE_MISALIGNMENT can be triggered by using SSE instructions, they require pointers to be aligned to 64 bytes. I haven´t tried it, though. It may also be possible in Windows Phone, ARM processors are also sensitive to data alignment.